A 21st-century update on a 120 year old classic. Rugged and technical for every day outdoors, yet clean and casual enough to wear to a backyard BBQ or around town. The AirLight Western Shirt is our take on the perfect all-around western shirt, and a study in modern technology — a workhorse of a shirt, cut in a classic style, and ready for anything. Made from a soft, airy polyester bolstered by durable, air-texturized nylon, the AirLight Western Shirt combines the outdoor durability of nylon with the light, soft feel of polyester. Articulated sleeves and mechanical stretch give the AirLight Western Shirt an impressive range of motion, and a nano-scale C6 Durable Water Repellant sheds water and stains to keep you clean and dry. Cut medium-lean for a tailored look. They fixed the long tail/sleeve issue. It’s now the perfect western snap shirt (I have many). The fabric drapes like my old gabardine shirts but much more robust. I love this shirt and wear it almost every day. A great product...and different in design-really comfortable and fits great!! So far I am really liking the airtight Western shirt. Seems to not wrinkle and it repels rain and those spills that sometimes happen. Haven’t put it through a rock climbing session but it seems like it will hold up. Great to wear outdoors and then also to a business meeting. Thanks for making great products and having decent prices. Got myself one over the summer. Nicest item I've purchased in a while. Got another to give to a friend as a gift. He loved it also. I'm very happy with this purchase. My only complaint is that the sleeves are way too long. It hasn't been a problem for me yet as I normally wear this shirt with the sleeves rolled up, but I need to get it altered. Apparently, this might be a problem with the batch I received, but it never should have shipped that way. If this has been fixed in future batches, I highly recommend this shirt! AirLight Cloth — we searched for over three years to find the perfect fabric for a Western Shirt. We knew that if we were going to try and update the classic western style, it better damn well be something we can stand behind. What we found is a light, airy polyester, bolstered by air-texturized nylon, with just the right amount of mechanical weft stretch. Performance fibers woven into a summer weight oxford style fabric that looks like cotton moves with the body breathes like a dream and is ready for just about anything. The fabric is finished with a nano-scale durable water repellant to stay dry in a light rain storm or dry quickly if it does get a little wet. Designed and sized for a flattering and slimming, yet comfortable fit. For reference on sizes and measurements see our size and fit guidelines. Active Fit: Flattering athletic tailored fit neither slim nor relaxed. 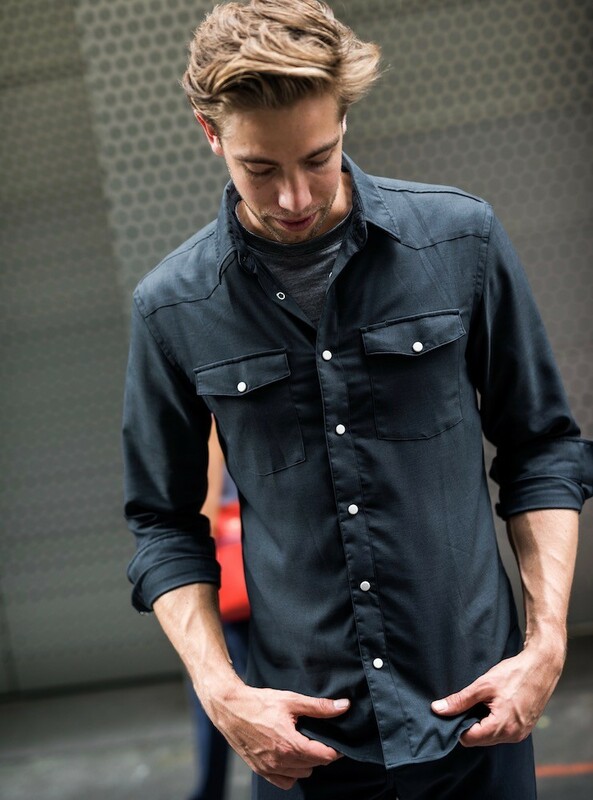 Please note: The Graphite color of the Airlight Western Shirt has slightly different cut than the Smoke and washed denim colors and has a 1.5" shorter sleeve length per size. The Graphite color size chart is shown below.